Haiji Senri (千理　牌示, Senri Haiji) is a human spell collector who admires the Senri Shrine. They are the Extra stage boss of Brilliant Pagoda or Haze Castle on the Brilliant route. Haiji is a spell collector. As such, they do it as a hobby where they run a spell card shop. They admire the spells they've collected by beating opponents in spell card duels over them, though some people have likened it to Haiji "stealing" their cards. It's said that Haiji is a endlessly irresponsible person. Haiji is able to manipulate cards. As such, they are capable of copying other people's spells and making them their own. The ability has some resemblance to Tsurubami's "raising poultry". Their full name is Haiji Senri (千理　牌示). Their first name Haiji (牌示) means "showing cards". Their surname Senri (千理) is pronounced the same as Tsurubami Senri's surname Senri (闡裡), but with different kanji. The first kanji sen (千) in their surname means "thousand", while the second kanji ri (理) means "logic" or "reason". The surname was copied from the Senri clan, but modified slightly. As such, it is unknown what their original surname was. Haiji is an Extra stage boss in Brilliant Pagoda or Haze Castle on the brilliant route. Haiji appears to admire the Senri Shrine and the Shinto priests from here. As such, they are a huge fan of the founder of the spell card system to Mugenri, the second-generation priest of the Senri Shrine. Haiji frequently hung around the shrine, and they were one of several people who got a close look at the course of Tsurubami's conquest of Mugenri. Haiji is Tsurubami's biggest fan and idolizes them. On their side, Tsurubami considers them a nuisance. Haiji seems to be jealous of Tenkai for being Tsurubami's best friend and close confidant. On their side, Tenkai considers them an annoyance. Since Haiji is a spell collector, they admire spell cards a lot. They are also a huge fan of who introduced the spell card system to Mugenri, the second-generation priest of the Senri Shrine. 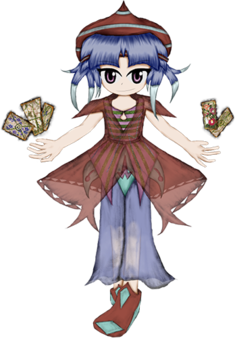 However, most of Haiji's spell cards are directly based on the spells used by various characters from the Touhou Project , mainly final and extra bosses. ↑ souzai (惣菜): pun on the similar-looking kanji Hourai (蓬莱). ↑ Reference to the Japanese internet meme "Fu-ji-saaan" (／^o^＼ﾌｯｼﾞｯｻｰﾝ), originating from the Denki Groove song "Fuji-san". When JynX was asked if Haiji has been to Gensokyo to copy Touhou spell cards in the second interview, they replied that it's "up to your imagination". Just like Tsurubami and Tenkai, when Haiji moves around, their sprite becomes black and white. JynX has stated that this is because they are copying Tsurubami. While Haiji is a fan of the Senri clan, their clothes are based on their own fashion sense, according to JynX. This page was last edited on 12 February 2019, at 11:00.